South Korea held a National Security Council (NSC) meeting Thursday to discuss ways to create an international air route linking the two Koreas, the presidential office said. 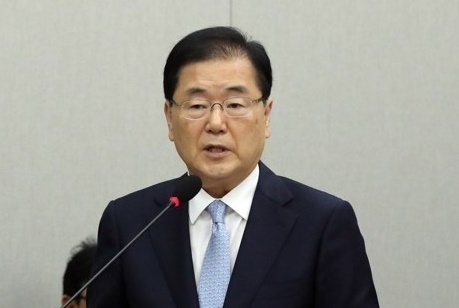 During the meeting of the council's standing committee presided over by Presidential National Security Advisor Chung Eui-yong, members shared the opinion that the new air route would increase practical benefits for not only the two Koreas but all airlines that will use it, Cheong Wa Dae said in a release. The members also discussed the two Koreas' recent work to destroy some of their guard posts in the Demilitarized Zone (DMZ) and verify the destruction and checked the progress of Seoul's implementation of a comprehensive military accord reached during the last inter-Korean summit in September. The agreement, aimed at reducing military tensions on the Korean Peninsula, included disarming the Joint Security Area (JSA), ceasing all "hostile acts" against each other along the border and removing some guard posts and land mines from the DMZ.